Sonia Gandhi and others raised slogans during protest over Rafale deal issue. 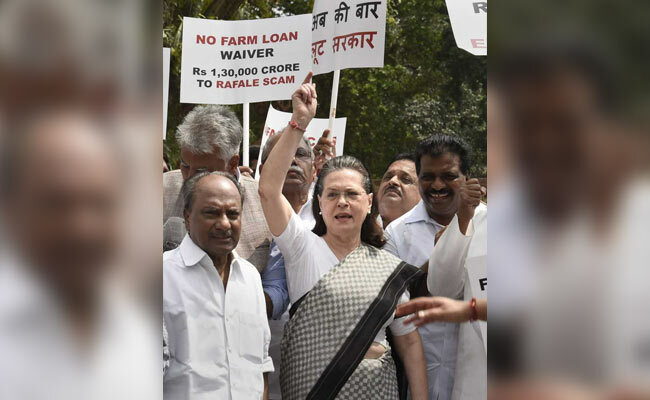 Protests over the NDA's Rafale deal erupted outside the parliament and Congress leader Sonia Gandhi led the opposition in its demand for a probe on the last day of the Monsoon Session. Opposition leaders, including Raj Babbar, Ghulam Nabi Azad, Anand Sharma, Ambika Soni, CPI's D Raja, AAP's Sushil Gupta among others were seen holding placards that said, "We demand JPC", "Modi Corruption Exposed", Rafale Cover-Up Out In the Open" etc. Congress president Rahul Gandhi termed the Rafale deal as the country's "biggest ever" defence scam and blamed Prime Minister Narendra Modi for it. He wants the government to explain how the price "magically" rose from Rs 540 to Rs 1,600 crore per Rafale jet. "This is the biggest scam of the world. We want a Joint Parliamentary Committee (JPC) to investigate the deal," Congress leader Ghulam Nabi Azad said in the Rajya Sabha today. Minister of State for Parliamentary Affairs Vijay Goel dismissed their protest and asked the ppposition to bring substantial proof before they accuse the Prime Minister of corruption. Congress leaders had turned down a breakfast invite from Rajya Sabha chairman M Venkaiah Naidu for today after the lawmakers weren't allowed to raise their concerns around the Rafale fighter jet deal. Mr Naidu had declined permission to leaders from the Congress and other parties to raise their demand for a parliamentary probe into the Rafale deal, and even switched off their microphones and hurriedly push through two bills despite their protests. Mr Gandhi had attacked Defence Minister Nirmala Sitharaman in parliament last month, for "lying to the country when she contended a secrecy pact didn't allow the government to put out details of the deal". Senior lawyer Prashant Bhushan had also said that the government was hiding behind the secrecy clause because "they know as soon as they put the papers on the table, the game will be up". 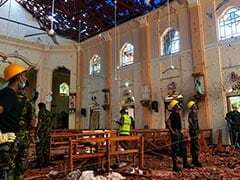 The charge was forcefully rebutted by the minister, who called it "absolutely wrong". "It was agreement of secrecy," she said and quoted the French President Emmanuel Macron's interviews to two media organisations. Union Minister Arun Jaitley also termed the allegations of misdoings in the Rafale deal as "unsubstantiated" and "reprocessed lies". "There is not a grain of truth in the wild allegations repeated nor anything substantiating in the purported facts and voluminous documents marshalled to corroborate the baseless accusations, Mr Jaitley said in a Facebook post titled 'The Rafale Falsehood Repeated'.